How Does a Bad Capacitor Affect Your AC? Most of the repairs needed in air conditioning units have to do with the electrical systems. In fact, this makes up about 85 percent of repair needs! This is because there are so many small components, circuits, and connections that need to be perfectly in place for your air conditioner to work properly. Even the smallest issue can cause your air conditioner to work less effectively, or worse, to stop working at all. If something seems to be amiss with your AC, it’s time to call the air conditioning repair professionals from Benjamin Brothers! One of the most important parts of the electrical system in your air conditioning unit is the capacitors. Without these working smoothly, the motors that power both the compressor and the fans cannot work properly. In today’s post, we are examining what it is that capacitors do for our systems, as well as what can go wrong when a capacitor starts to fail. Capacitors can be thought of as short-term batteries. They are small and shaped like cylinders, and they store their energy within an electrostatic field. When they are properly attached to motors, they send an electrical signal that starts the motor or a series of jolts to the motor to keep in running. In any given air conditioning unit, capacitors work with three motors: the blower motor, the compressor motor, and the outside fan. A few things can happen to a capacitor that will cause it to fail or begin to shut down. For example, they may become damaged from excess power, or they will just wear down to a point where they can no longer hold an electrical charge. As the capacitor starts to fail, you will most likely be able to hear a small clicking coming from within the cabinet. Calling for repairs at this time will make the process much simpler and less expensive! If the run capacitor or start capacitor (or both) dies, then the motor it is attached to will keep trying to turn on. Instead of turning on, however, it will likely make a humming noise. If this keeps happening, the motor may eventually burn out and need a full replacement. This is a lot more work! 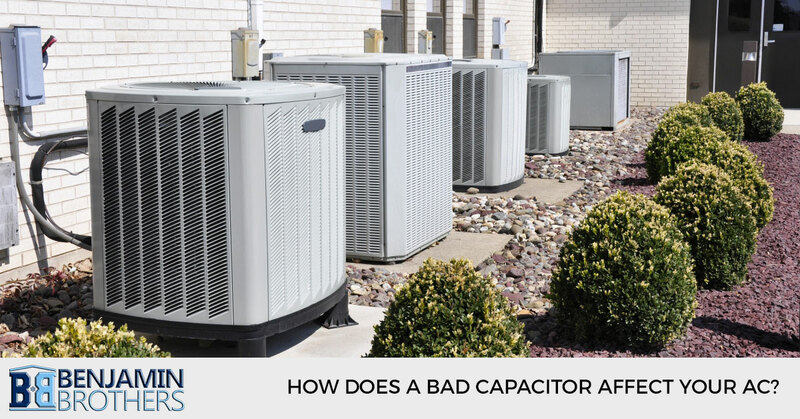 Those capacitors that have lost their strength and are connected to the compressor can lead to a condition that is referred to as “hard starting.” This is where the AC has a hard time turning on, and it will shut off again shortly after starting. This puts a bunch of unneeded pressure on the compressor and the rest of the AC’s components. When this happens, the system will definitely need professional repair work as soon as possible. In most situations, our professionals will replace the capacitors that are risking the entire functioning of the air conditioner. Please never attempt to replace the capacitor on your own! The oil that tends to leak from broken or damaged capacitors can be extremely dangerous to handle if you are not trained on how to do so. Although it’s the electrical system that needs the most air conditioning repair services, you can also prevent a lot of these issues by regularly taking care of your HVAC system. If you need any repair work done, please do not hesitate to contact the professionals at Benjamin Brothers! We can help your air conditioning unit get back to the way it was before: providing cool and fresh air to all areas of your home or business. Trust our professionals to get everything up and running again smoothly; call us today to get started!